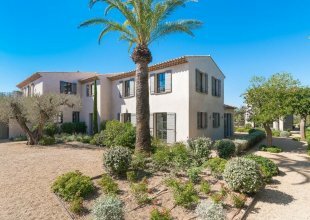 Villa Talula lies in the hills above the beaches of Saint Tropez, a villa designed for those who seek secluded first-class relaxation coupled with breathtaking views and in close proximity to all the action Saint Tropez has to offer. No location could be more idyllic for a Saint Tropez residence. Set in secluded grounds of terraced olive groves and with an infinity pool overlooking the countryside and sea, incredibly Talula is only a few minutes’ drive from the glamorous private beaches of Saint Tropez. 8 minutes drive from Pampelonne, 12 minutes from Saint Tropez and 1.5hrs from Nice airport. No detail has been spared by international interior designers Cox & Cox who have created a modern and fresh approach to Provencal luxury. Fully equipped with only the finest furniture and accessories this superb villa can accommodate up to eight guests in supreme comfort and luxury. The living area is spacious and contemporary with all of the facilities you would expect including full climate control, sky television, internet and media system. The kitchen is equipped to the highest standards and serves 3 different eating areas. Outside the villa is a truly stunning infinity swimming pool which looks out over uninterrupted countryside leading to the sea and Poquerole islands. There is substantial seating, including two sofas as well as ten loungers and various other outdoor furniture. The Master Suite on the top floor takes advantage of the unobstructed panorama, with views stretching as far as the Porquerolle islands. The mahogany bathroom and walk-in wardrobe and dressing room are nothing short of luxurious. 3 Guest Suites all have en suite bathrooms, air conditioning and are furnished with bespoke designer furniture and accessories. They feature flat screen entertainment systems and each has its own secluded outdoor area. There is also an additional bedroom with a double bedroom with no outside access which is ideal for little ones. Fully equipped with only the finest furniture and accessories this superb villa can accommodate up to 10 guests in supreme comfort and luxury. The villa boosts 3 double bedrooms, 1 twin room and an addition children's bedroom area with dual access leading from two other ensuite bedrooms. We can offer either a double bed or double bunk beds depending on your requirements. The ideal sleeping solution for families or those with addition guests. 372msq, 3 floors plus gardens. • Bedroom with en suite shower room, dressing room and WC. • Room filled with fitted wardrobes, utility room, boiler room, 2 car garage, wine cellar. • Bedroom with en suite bathroom with bath, shower and WC and dressing room. • Master bedroom suite with dressing room, bathroom with bath, shower and WC leading onto terrace. • Attractive landscape garden of approximately 2412m squared with infinity pool.